Slate’s Jamie Bouie has a nice piece on how the politics of Social Security have changed, at least among progressives. Now, I happen to think the Social Security expansion plans are largely delusional – there simply isn’t enough money to do it. But it’s a very interesting political development that will play out through next year’s Presidential campaign. 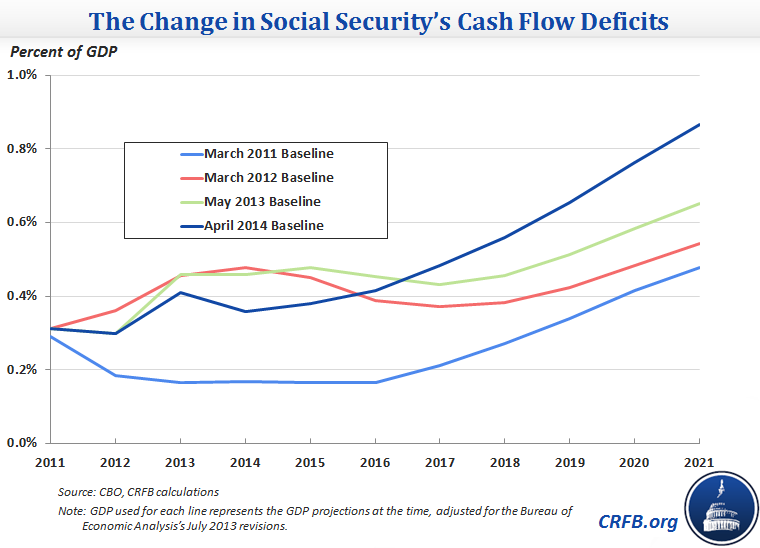 Reform Social Security by Eliminating the Payroll Tax? Over at U.S. News, Dean Clancy argues that eliminating the payroll tax – and thus paying for social security out of general tax revenues – simplifies the problem of how to fix the program. Why not supplant the payroll tax altogether, and as soon as possible? The payroll tax is the biggest tax most Americans pay, and regressive. It falls hardest on low-wage workers. Eliminating it would provide meaningful relief to every American wage-earner, with the greatest relief going to those who need the the help the most. Abolishing it would be economically beneficial and politically popular. To avoid increasing the deficit, we could raise or impose other taxes that are less regressive – although, to be honest, I’m not sure we really need to. If anything, America’s less-than-stellar economy could stand a tax cut right now, and what better kind of tax cut than one that reduces burdens on job creation? I like $800 billion annual tax cuts as much as the next guy, but this just seems crazy to me. The grid—designed for cases that fail to meet the listings—uses age, education/skills level, and language proficiency as determinations criteria. But the grid has grown increasingly outdated even as its use proliferated. Continuing to eschew the listings in favor of the grid is fiscally unsustainable, and grossly unfair to current workers. Bloomberg’s Megan McArdle has an interesting piece on the tensions facing progressives who wish to reform – and expand – Social Security. Another favorite is eliminating the cap on Social Security taxes, which is a slightly less vague way of saying "the rich". Every time I discuss Social Security, at least one angry person will demand to know how I can so disingenuously claim the system is in need of reform, when "all we need to do is get rid of the cap on the payroll tax." All? "All we need to do" implies some sort of modest, unremarkable undertaking. In fact, as the Committee for a Responsible Federal Budget points out, this amounts to a 12.4 percent surtax on all income above $118,500. That's an enormous tax hike, which would generate exactly the same pushback you'd get if you announced, well, a 12.4 percent surtax on all income above $118,500. The whole article is worth checking out, here. Over at e21, Chuck Blahous looks at ideas that have been floated to merge the Social Security retirement and disability trust funds. The idea holds appeal to some as a way to forestall the disability fund’s insolvency, projected to occur in late 2016. However, Blahous sees some significant downsides to the idea. You can check out the whole article here. Allowing the Social Security retirement age to continue its gradual increase, from the current age of 66 today, to the already-legislated level of 67 in the year 2020s, and eventually on to 69 by 2034. Eliminating the 12.4% Social Security payroll tax for individuals aged 62 and over. My take: I’m okay on raising the retirement age along with longevity, though I didn’t include it in the plan I outlined in National Affairs. Also in National Affairs, I wrote against means-testing Social Security benefits. A means-test is an effective tax on work and saving, and those are things we want more of. I also don’t believe any politically-viable mean-test will produce significant savings, so I’m not sure it’s worth the effort. The payroll tax cut for older workers, however, is a good idea that I championed in the Wall Street Journal. Social Security pays very poor returns to workers on the cusp of retirement, but these individuals are very sensitive to changes in after-tax wages. Reducing the payroll tax could significantly increase labor supply from near-retirees, improving both the economy and their own retirement security. Rising life expectancy makes defined benefit pension plans more expensive. The question is the extent to which state and local plans have already incorporated rising life expectancy into their cost estimates. a stricter standard that fully incorporates future mortality improvements. Under the first scenario, liabilities and funding would barely change. Under the second, the average funded ratio would drop from 73 to 67 percent. Social Security’s trustees have long warned Congress to address the troubled finances of the Disability Insurance (DI) program. Given the DI trust fund’s projected exhaustion date of 2016, legislation will be required during this Congress to prevent large, sudden benefit cuts. Will Congress take this opportunity to begin the critical reforms necessary to put DI on a sustainable fiscal path? As we await the coming spring release of the 2015 Social Security Trustees report, it's important to recall that the 2014 report showed a continuation of the current trend toward insolvency of both the retirement and disability trust funds. The trustees last estimated that Social Security's combined Old-Age and Survivors Insurance (OASI) and Disability Insurance (DI) trust funds will become exhausted in 2033, less than 20 years from now. While the larger retirement fund is estimated to be depleted in 2034, the disability trust fund will run empty in 2016, right in time for the presidential election. It's unlikely that the 2015 report will show much, if any, improvement. You can check out the whole column here. The commission created by the legislation would be composed of 13 commissioners: three commission members appointed by each of the Democratic and Republican leaders in the House and Senate and a Chair appointed by the President. At least one of the congressional appointees from each party must be non-elected experts, but the other ten commissioners appointed by Congress could be either sitting Members of Congress or unelected officials. The commission would be directed to report to Congress its recommendations for making the Social Security trust fund solvent for at least 75 years no later than one year after its first meeting. The commission must have a minimum of nine votes in favor of its recommendations to send the plan to Congress for consideration. Achieving that level of support for recommendations will be difficult but will ensure that they have bipartisan support. The legislation sets out a process for expedited consideration of the commission recommendations in the House and Senate for an up-or-down vote without amendments.